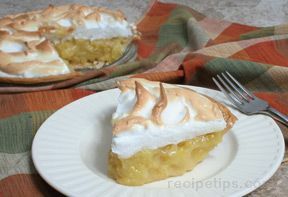 Classic lemon meringue pie gets a flavor boost with the addition of lemon extract in the filling as well as the meringue topping. 1. Preheat oven to 350° F. Mix sugar and cornstarch in medium saucepan. Gradually stir in water until smooth. Stir in egg yolks. Stirring constantly, bring to boil on medium heat; boil 1 minute. Remove from heat. Stir in lemon juice, butter and lemon extract. Pour hot filling into baked pie crust. 2. For the Meringue Topping, mix sugar and cream of tartar. Beat egg whites in small bowl with electric mixer on high speed until foamy. 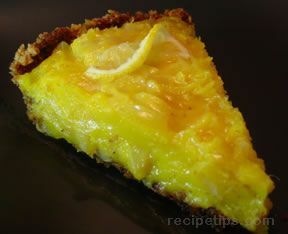 Gradually add sugar mixture and lemon extract, beating until stiff peaks form. 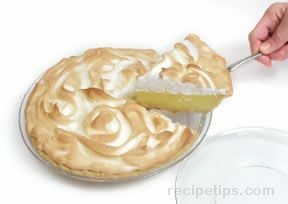 Spread meringue evenly over hot filling, sealing to edges of crust. 3. Bake 15 to 20 minutes or until meringue is golden. Cool completely on wire rack. Store in refrigerator.